Maya Plant Use: Medicine as well as product, food, beverage, ritual use and animal forage. Cups or containers of dried calabash fruit called jícaras were used by the Maya. Fruit used for lung congestion, bronchitis, asthma, and coughs. There are also ritualistic uses of the calabash gourd to prevent hypertension and relieve hiccups (Arvigo and Balick, 1998). 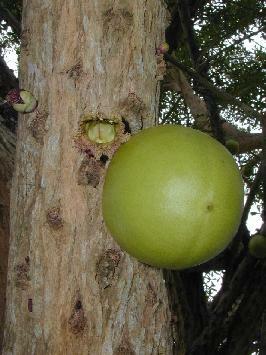 Another member of the Bignoniaceae family, Tanaecium nocturnum (a climbing vine) is used in a tea for diarrhea when mixed with an unidentified member of the Leguminosae family. It is also used as an aphrodisiac. Botanical Significance: There is much debate over the type of tree depicted here. In the story of the Popol Vuh, “The severed head of one of this unlucky pair (now known to be the Maize God) is hung up in a tree-said to be a calabash tree in the story, but pictured as a cacao tree on a Classic Maya vase,” (Coe and Coe 1996, p. 41). It may be a clabash for the follow botanical reasons: The leaves on Protium copal, and Pouteria sapota do not match the distinct leaves in this representation. Theobroma cacao, despite its importance, was ruled out due to the shape of the fruit not matching that in this representation. It may be surmised that Cresentia cujete most closely matched both leaf and fruit in this depiction. Ritual Significance: The calabash tree was important to the ancient Maya dues to its mention in the Popal Vuh, so it no surprise that it would be represented in important depictions. The Popol Vuh or seventeenth-century “Community Book” of the K’iché Maya tells a creation story of the young ballplayers who disturbed the Lords of Death with their activity. Being summoned to Xibalba, or the Otherworld, upon losing a set of trials were buried in the Ballcourt of Sacrifice. The head of Hun Nal, the Maize God, was hung in a gourd tree to warn others of such similar behavior. 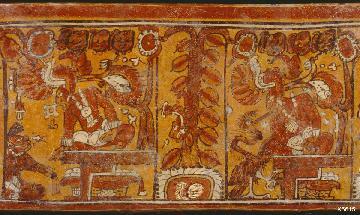 The daughter of Xibalba communicated with the head on the tree, which spat on her and made her pregnant. She gave birth to twins; Hun-Ahaw and Yax-Balam. When grown, the Lords of Death summoned the twins to challenges, with the twins defeating them. The twins then resurrected the Maize God who later made heaven and the earth and all living things on it. In the discussion of the Hero Twins, Bassie-Sweet states, " However, the decapitated head of One Hunahpu is placed in a tree, which then bears fruit that is similar in shape to human heads," (Bassie-Sweet, 1991 p. 88).